France has a long history of making quality cheeses. 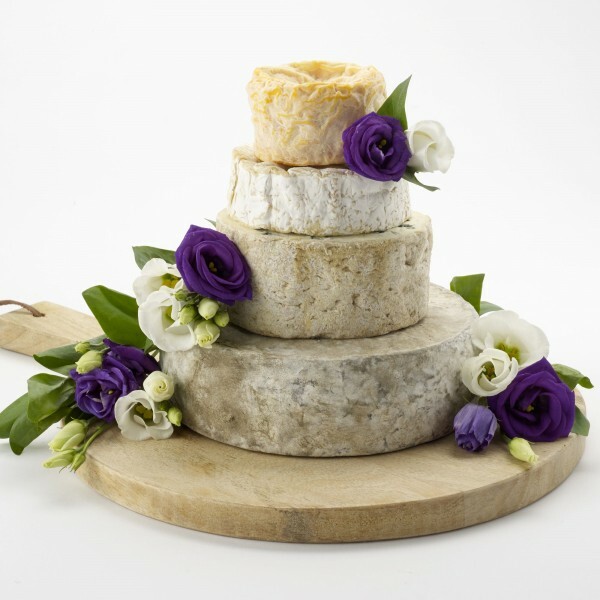 This cheese wedding cake brings together a representation of its well known and more obscure examples. To serve approximately 50 people - perfect for celebrations and weddings. The diameter of the base cheese (Tomme de Savoie) is approximately 17cm. Langres PDO 200g x 4- Historic cheese with a unique truncated shape. Depression in the centre designed to hold Champagne or marc. Camembert de Normandie PDO min wt 250g x 2 - A great example of one of France’s iconic cheeses. Fruity yet earthy flavour with a supple texture. Fourme D'Ambert PDO min wt 660g - Made since the Middle Ages, this firm textured, creamy cheese has a distinctive cylinder shape and a mild, fruity flavour. Tomme de Savoie 1.5kg - A stronger flavoured Tomme de Savoie, made & matured in the Savoie region of France. NB Decoration and board not included.